From Goodreads: It’s the end of the world. Six students have taken cover in Cortege High but shelter is little comfort when the dead outside won’t stop pounding on the doors. One bite is all it takes to kill a person and bring them back as a monstrous version of their former self. To say I was excited to read this would be a massive understatement. I devoured it the moment it arrived on my ereader and I can honestly say it completely lived up to all my expectations for it. As many of you have probably worked out I adore Courtney Summer's books. 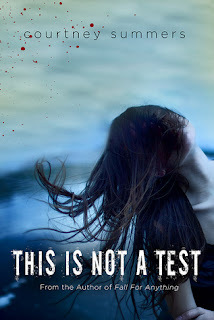 I have been a huge fan of hers since I first read Cracked Up To Be and the minute I heard the synopsis for This Is Not A Test I knew, just knew, I would love it. As a big horror fan, the idea of her writing a story based around zombies filled me with glee! And I loved the way she approached it. Sloane was such a fascinating character. I loved her. She's so broken - with very valid reasons to be that way - and seeing the events unfold through her eyes was really interesting. For someone convinced they no longer wanted to live she still seemed to have a lot of fight in her and still cared for those around her. I also really loved Rhys. From pretty early on you could feel a connection between him and Sloane and I really liked the way their relationship progressed. Cary was also a very intriguing character - someone forced into making the hard decisions. The setting in the school gave the story both a safe and claustrophobic atmosphere. The idea of the all that banging and sounds coming from outside gave me the creeps, and of course, the idea that they could break in at any minute was terrifying. But at the same time it gave enough of a feeling of safety that the moments and arguments between the characters felt realistic - and it's interesting how in this kind of situation it becomes less about what is happening outside and more about the dynamics and dangers inside. I loved the ending too. I know for some it will be too ambiguous but for me it gave me the answer to Sloane's internal battle. I felt a decision was made. Of course, if Courtney Summers decided to write a sequel I would be first in queue - I loved this world and wouldn't hesitate to go back there. It's the first book that has creeped me out so much in a long time (I'm embarrassed to admit I slept with the light on after finishing it!) and if I ever needed more evidence of Summers brilliance as a writer I found it here. Seriously fantastic! I feel bad that I still haven't read a Courtney Summers book after you raved about them so much. I wonder if this one is still on NetGalley. Rushes to look. Yes! I NEED to get this book as soon as it comes out!